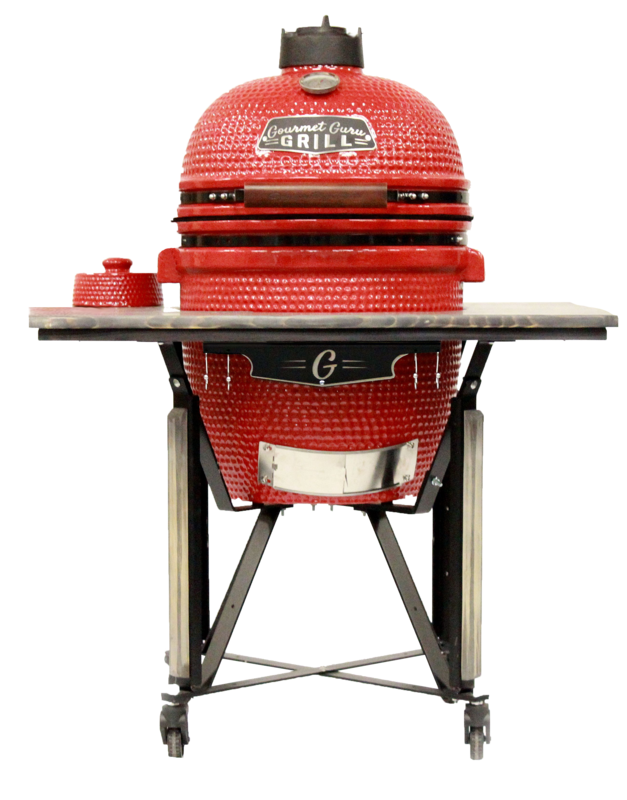 Gourmet Guru Grill offers a variety of grill tables, grill carts, and grill cabinets to house your new ceramic cooker. Each has its own style and benefits. Which Gourmet Guru Grill cabinet is right for you? Gourmet Guru Grill’s Metal Roll Cart is great for those who like flexibility and functionality. This cart is equipped with four caster wheels which make it a great mobile grill. The two metal side tables give you enough room to sit any utensils, accessories, or spices you may be using. Have a small space? Don’t worry. After you finish grilling, simply fold the two sides down. This is great for those who need to store their Gourmet Guru Grill when it’s not in use. This affordable grill cart will hold the Original grill, Deluxe grill, or the Extra Large grill. The Gourmet Guru Grill Roll Cart Table offers the same grill mobility as the Guru Metal Roll Cart and so much more. This portable grill cart was designed to raise your Guru Grill to a comfortable and optimal height for cooking on your grill. The grill’s top is made from rot-resistant cypress wood and provides enough space to prep your food before placing it on the grill. There are also hooks attached to the front of the cart for hanging grilling utensils and oven mitts. The Guru Mobile Stand is made from rust resistant, durable, powder-coated steel. And because the grill stand is equipped with four easy lock wheels, you can move your grill where you want and never have to worry about your grill cart moving while cooking up your next feast. It has style. It has prep space. It has mobility. 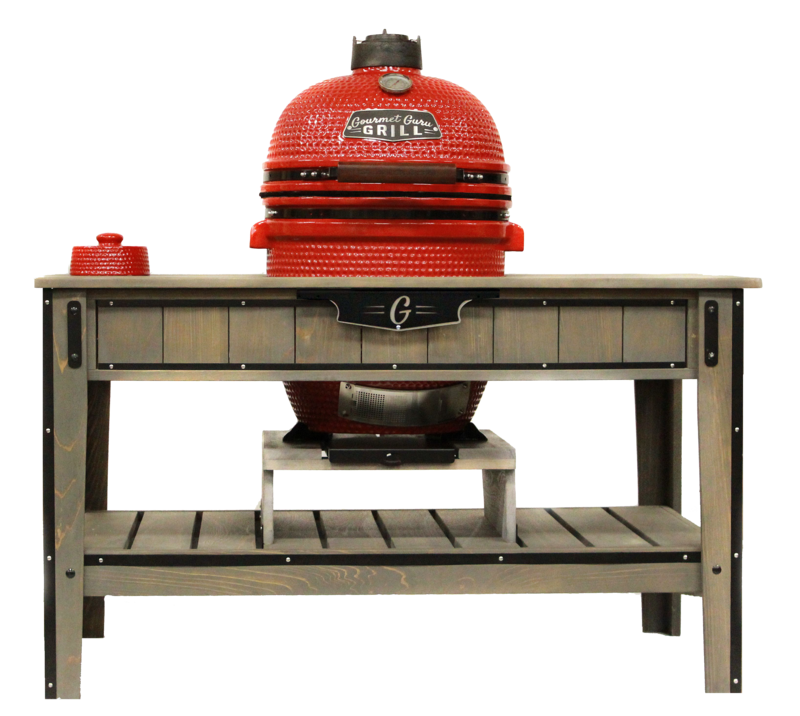 The Guru Universal Table by Gourmet Guru Grill has it all. The table top is metal with a stunning Cypress trim. And like our other grill carts, this grill table is also portable and durable. The best part is that it fits all sizes of the Gourmet Guru Grill. Don’t own a Gourmet Guru Grill? 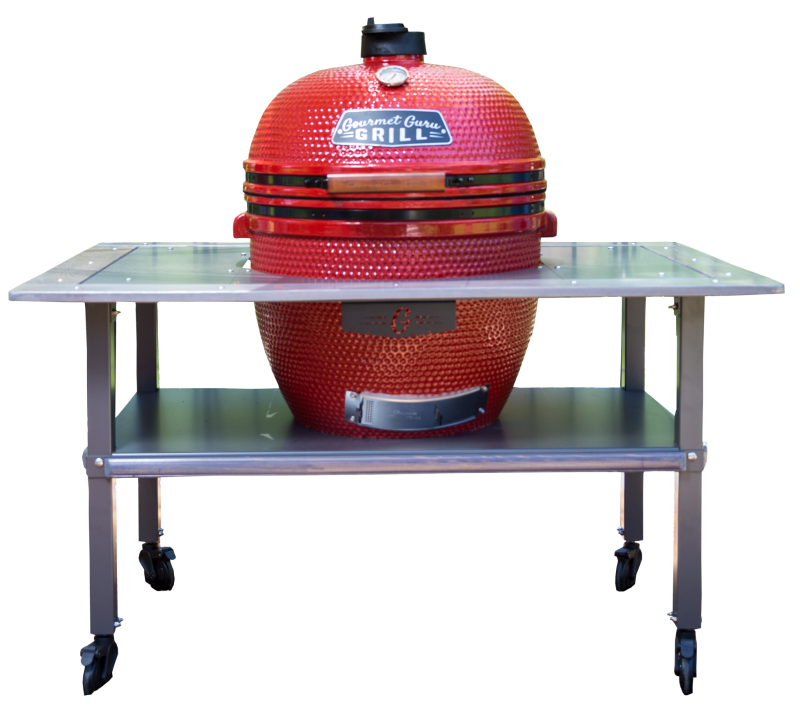 The Guru Universal Table is also designed to fit many other Kamado style grills. The table is great for those who like the metal look but also need a little more room to prep their meals outdoors. There is even a little shelf space to keep your grill accessories out of the way. THE GURU VINTAGE TABLE IS THE GRILL TABLE YOU ARE LOOKING FOR! For those looking for a grill table that is durable and stylish, take a look at the Guru Vintage Table. The Guru Vintage Table is made from rot-resistant, real cypress wood. This gives the grill table a subtle but stylish appearance and the protection it needs to last for years to come. The grill table also comes with metal accents and is designed to give the overall appearance of an old whiskey barrel. The table top has enough space for any grill guru to set up shop, prep food, and stage dishes before presenting them to friends and family. The Guru Vintage Table is great for those who need additional storage space. The lower shelves provide enough room to store all of your grill accessories and tools. It is also small enough to fit in smaller, confined spaces. And because it has casters, you can easily move the grill table where you need it and move it out of the way when you are finished grilling your masterpiece. The Guru’s Choice Deluxe Cabinet provides the best outdoor grill prep station and offers the best outdoor grill experience. 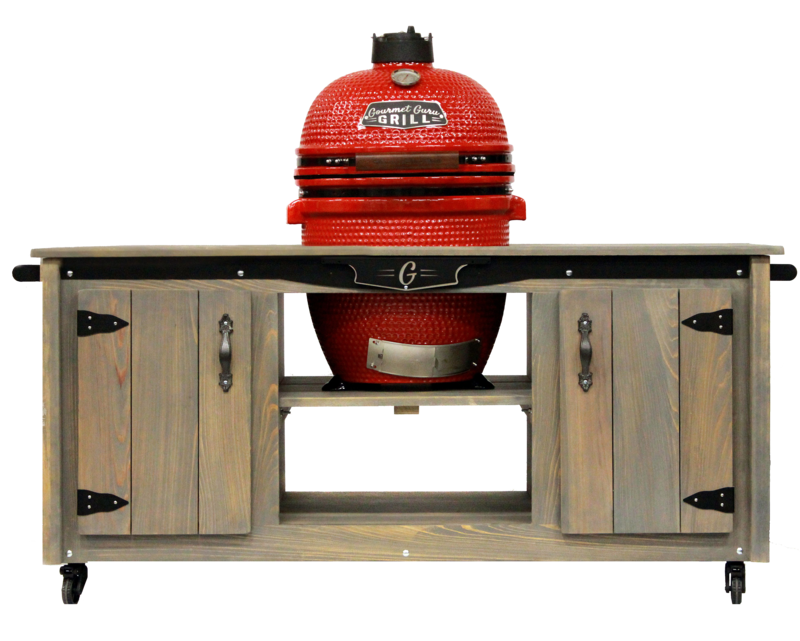 Like the Guru Vintage Table, our deluxe grill cabinet is made from real cypress wood to give it extreme durability and an amazing look. Want to change up your outdoor living space? No problem. The Guru’s Choice Deluxe Cabinet has a heavy-duty handle and caster wheels to make moving the grill cabinet easily and smoothly. For those who like a more clean and organized look, there are two cabinet doors to hide all of your spices, rubs, grill accessories, pots, pans, and “stuff.” There is also an additional shelf under the grill for even more storage. WHICH GOURMET GURU GRILL CART WILL YOU CHOOSE? 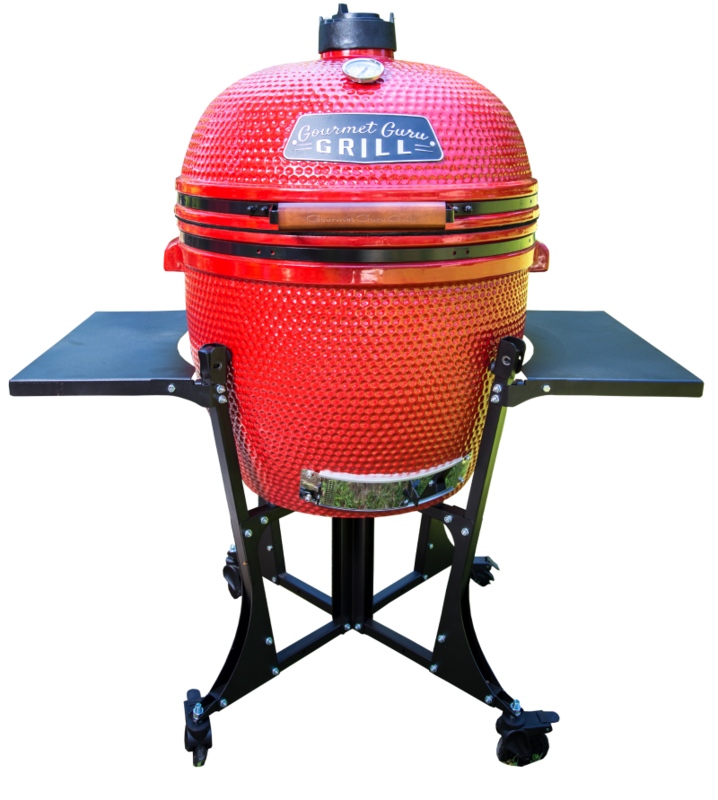 Whether you have taken on the tiny house lifestyle or you are looking for a piece to create a breath-taking outdoor living space, Gourmet Guru Grill has the perfect grill, cart, and cabinet to fit your life and ceramic grill cooking needs. 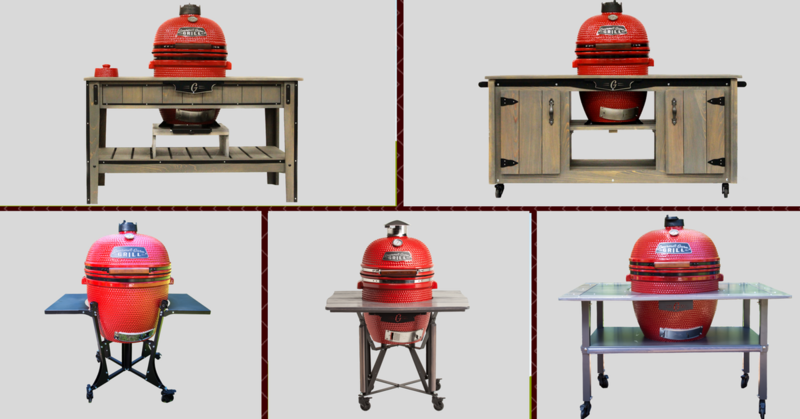 You can buy these grill carts, grill tables, and grill cabinets on our website at GOURMETGURUGRILL.COM or find a GURU GRILL DEALER by clicking HERE. Need new ceramic grill recipes and inspirations? Check out the RECIPES and VIDEOS on our website and LIKE our FACEBOOK page.